The wood router is the most versatile and essential tool in a woodworker’s workshop. An ideal wood router and a set of bits help a woodworker come up with many intricate designs, create joints, “rout out” grooves, shape wood edges, and perform many other functions. There are a number of wood router types and once you understand their differences you can make a wise choice on a router that meets your needs and the projects you have at hand. Basically, there are three router types: Fixed Base Router, Plunge base, and Interchangeable or Combo Router kits. The router design will determine the type of work you can handle. This type of wood router has a base that is spring loaded. With this type, you can shove down the bit into the wood. Its base can be locked at particular depths when working on specific applications. With this type of routers, you can easily change the depth of the bit while it is running by simply unlocking the depth release. Plunge routers are normally a bit complex to operate when compared to the fixed base and also more expensive. With this type, the cut begins in the middle of the work piece instead of the edge. Plunge-base router is much easier to make precise cuts at the center of the workpiece. You can easily make through cuts, mortise, pattern and template work, and deep grooves. Usage: They are convenient to use since you can easily adjust the depth while working on your project. Safety: It is safer than fixed base since its bit protrudes only when cutting. Excellent functionality: You get increased vertical movement control when cutting and you can easily get accurate cuts in the middle of the piece of work. They also have more power when compared to fixed base. Excellent effect: With its depth adjustment knobs, you can change the bit height more precisely. Superior design: It comes with an ideal design that facilitates various tasks such as making deep inlay grooves, pattern or mortises, as well as through cuts. Hard to use and maintain: You need more practice for you to properly understand how to work with this tool. Functional Limitation: Cannot be used with a router table or bench. A plunge router is a tool that should be in every workshop. It is an excellent machine for tasks such as mortising, inlays pattern tasks, stopped dados, template routing, making joints, and is ideal for using specialized bits. It is ideal for professional and experienced wood workers. This is ideally one of the best routers for beginners. It delivers exceptionally when fitted on a router table or bench. They are a perfect fit for edge cutting and molding tasks that demand straight line precision. In terms of weight, these routers are lighter than plunge routers and easier to use as well. While in use, the fixed base router cannot be adjusted for blade depth like in the case of plunge base routers. With this type, you have to set the blade depth before you begin routing. You can use many styles to adjust the bit up or down by simply twisting the house so as to screw or unscrew the router. Fixed-base router-are excellent all-purpose routers for most home and professional projects. They are compact in size and easier to maneuver and thus are excellent edge shapers. Usage: They are easy to use and thus are ideal for home use and beginners. They are also easier to handle and carry since they are compact and light. Excellent functionality: It delivers exceptionally when edge-shaping and gives the best precision cuts. They can also be used on a router table. Price: They are much cheaper compared to plunge base routers since they have less moving parts. Limited effect: They are not as versatile as plunge base routers. Limited functionality: They cannot handle certain tasks such as over cutting or gouging due to the fixed base for certain tasks. The fixed base router is ideal for tasks that require more control since with this router the hands are closer to the workpiece. They are more stable and hence ideal for freehand edgework. They are also ideal for repeat applications. It is also excellent for tasks that require a router table. This type of router is good for beginner wood workers. They are also referred to as interchangeable bases. They offer both plunge and fixed base choices which can easily be interchanged by simply removing the motor from one and fixing it on the other base. With this type, you can enjoy the features of both fixed and plunge base and expand your design capability without the need to buy two different types of routers. You can also choose to attach one to the router table and leave the other to be carried around. Combo router kits are much lighter to carry around compared to carrying multiple routers. Those woodworkers who change bases in most of their daily tasks may in the long run find it more efficient to buy two router types instead of changing bases all the time. 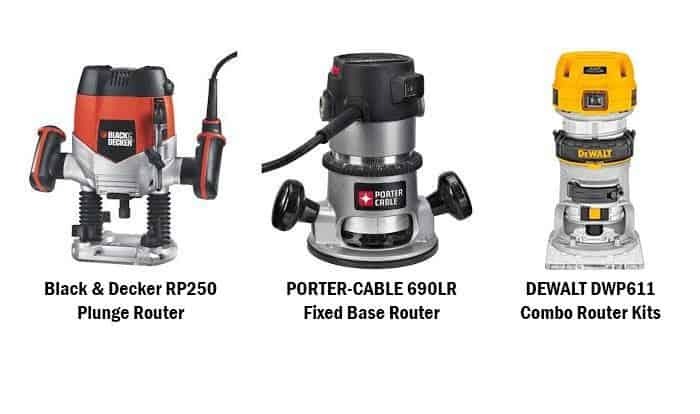 Combo router kits-these types of routers allow you to upgrade your base or buy bases that have different handle styles at a cheaper cost instead of buying a new router. You can also attach one base to the router table and leave out the other to be carried around. You enjoy the benefits of both fixed and plunge base routers. Convenient usage: Ideal for those who need to be fixed and plunge base functionalities. Price advantages: You enjoy the benefits of two bases without the need of buying two routers. Excellent functionality: You can perform the functions of two routers using this router type. Cumbersome to use: It is quite a challenge to keep switching between bases especially for the woodworker who keeps changing tasks. In such a case it would be more viable to buy two different routers. The combo router kits offer both benefits of fixed and plunge base routers. You can even upgrade the base or buy a base that has different handle style at a lower cost instead of buying a new router. You can mount one base on the router table and use the other free hand. This is ideal for all user levels; whether beginner, intermediate or professional woodworker. How Does a Dremel Work as a Router?